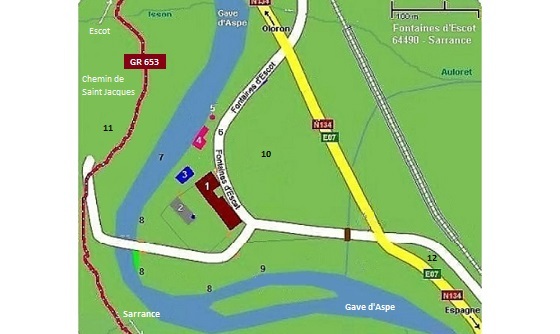 This property plan of Fontaines d’Escot will help you organise your stay! The perfect place to unwind in the Pyrenees! You can choose to stay either in our B&B Suites (breakfast included) or in our self catering gites. Reception rooms are also available for renting. The fronton is located in the middle of our enclosed garden. It is used to play the local sport, Basque pelota. This is where the historical thermal station is located. There is a small path going down from the main building. There are several baths carved into rock and filled with thermal water. One is still intact! Used to be the National road before the bypass was built. It provides ample parking space. The Aspe river is a beautiful river, perfect for fishing. Sandy and stone beaches, perfect for relaxing. The water is deeper and calmer here and is good for swimming. The rock has been carved by the river forming coves with natural sculptures. This hill is located between the national road and our property. Saint James Way follows the Aspe river and then goes to Spain. Perfect walking path to explore the Aspe valley. This is a geological Spot of a well documented geological tour of the Pyrenees. A big official panel explains the interesting geology of Fontaines d’Escot.